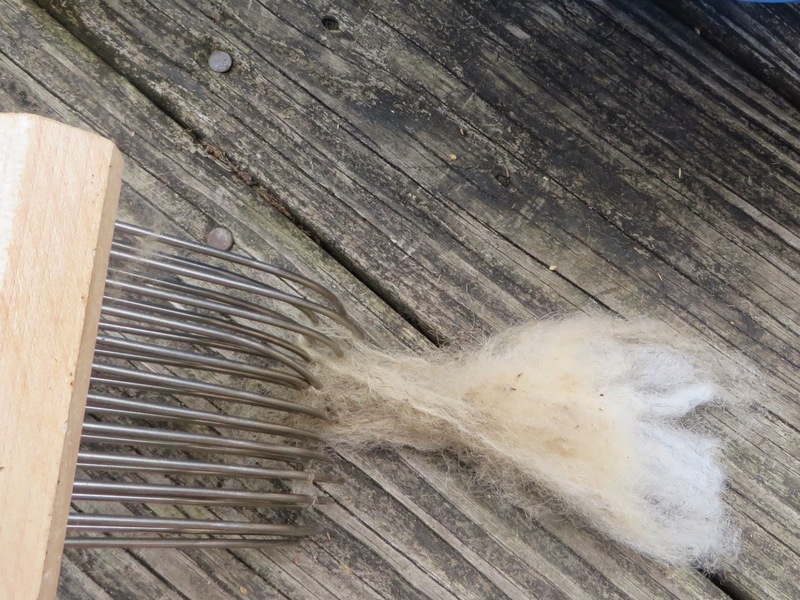 The shetland fleece, outer side up. It's an incandescent day, ueber-sunny, cool and pleasant, and the cicadas are singing. 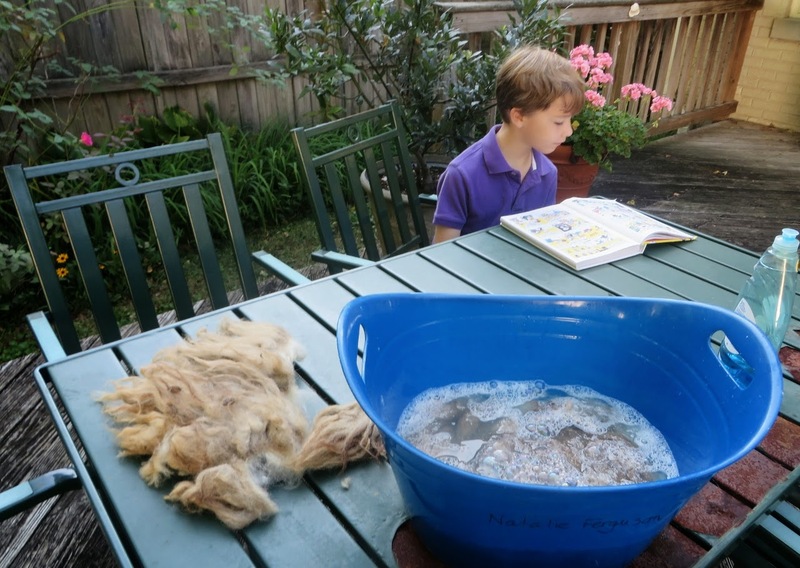 With Noah home from school with a fever, it's a good opportunity to scour more of Rosemary's shetland fleece. Edit: This post was written before we knew that both boys were going to be really sick for days: high fever, headache, stomach issues, congestion, the works. Little curled-up balls of woe, they were. Christopher is still mending. Let's take a picture walk, and see how I prepare it for spinning. The first job was to skirt the fleece. That means taking the extra-dirty, hay and burr and dung-touched outer edges of the fleece. 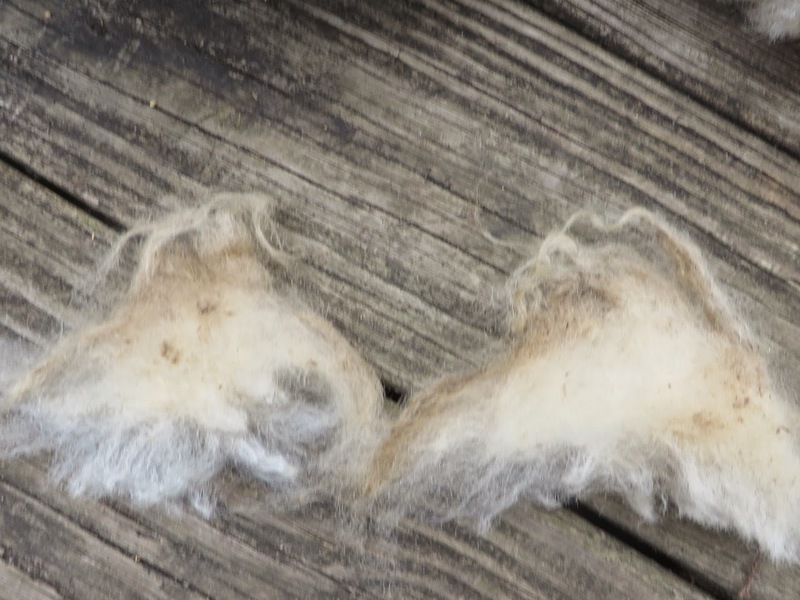 Since the edges are made up of the belly side of the sheep fleece, it's no wonder it's so dirty, because little Mr. has been running around a meadow all year. 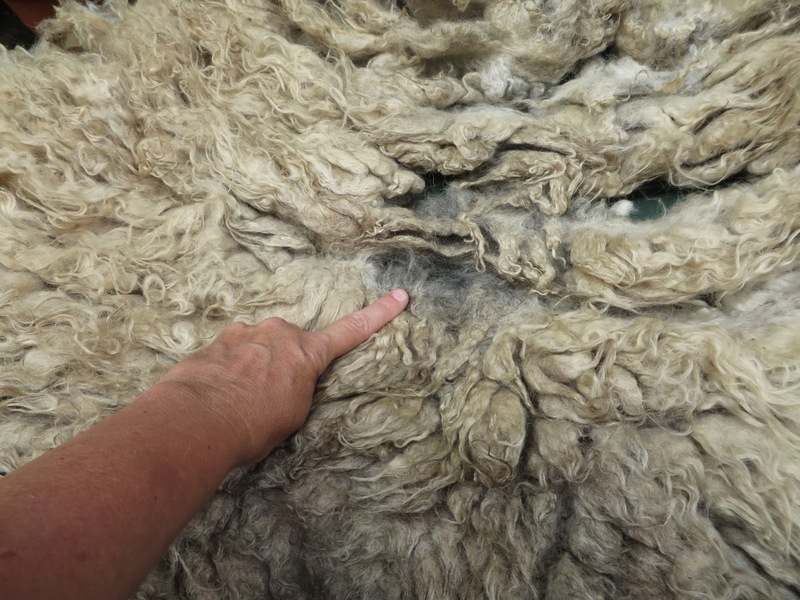 In the first picture we see the fleece, outer side up. Notice how long the wool is. Shetlands grow beautifully long locks. 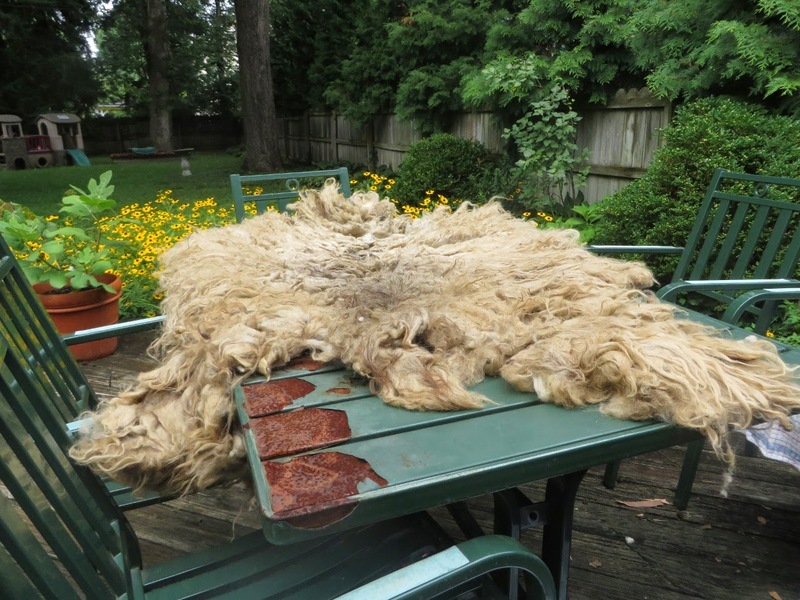 Notice that the fleece almost looks like a sheepskin rug in need of a wash. That's how thick the sheared fleece is! Here is Mr. Shetland himself, in a picture taken by Laura Lough of Square Peg Farm. The sheep may be part Soay, another rare and "unimproved", as they call it, breed. Unimproved my eye. How anyone can improve on an impressive set of colors and softness fit for baby clothes, I can't imagine. 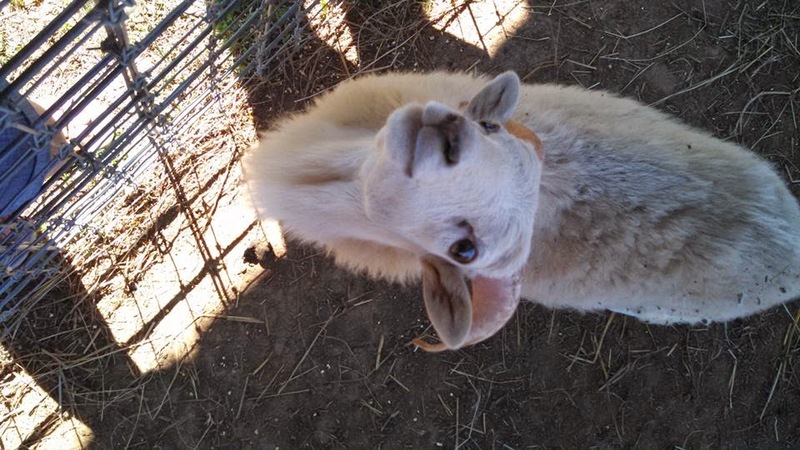 Rosemary's Shetland, who might be a Shetland-Soay mix. He was shorn recently and its his fleece I'm working with. He's a sweetie and appears to be looking up for a potential treat. Photo courtesy Square Peg Farm. Shetland fleece, skin side up. Notice the gray undercoat on the back? The back is in the center of the fleece and is the cleanest, highest-quality part. Here is the outside, close up. Shetlands have waves in their wool. Here I am pointing to the gray undercoat. Here I have pulled off a lock of the wool near the section that was close to my sheepy boy's head. It has lots of "VM", vegetable matter in it. In this big set of locks, I have spotted two fat burrs. They'll come out right away. A lock of Shetland wool typically is triangular-shaped. That's because Shetlands are a very, very old breed. 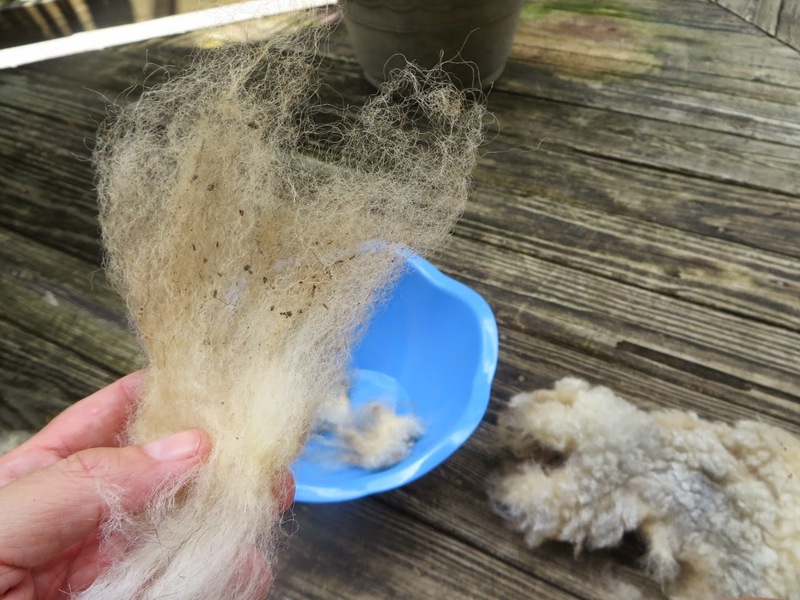 Like other early sheep, they have a long outer coat with guard hairs, and then a fine, very soft undercoat. The outer coat is thinner, the inner coat thicker, and so produce the characteristic triangle shape. There are lots of ways to get the VM out. One of the most common is to comb it with very sharp combs. I am using one here. Or I can use a smaller, blunt-tined comb. Once the locks have the worst of the VM out, they are ready to be washed, called scouring. In the case of this morning's scouring, the locks were so clean that I am scouring them without doing anything other than removing burrs and big stuff. 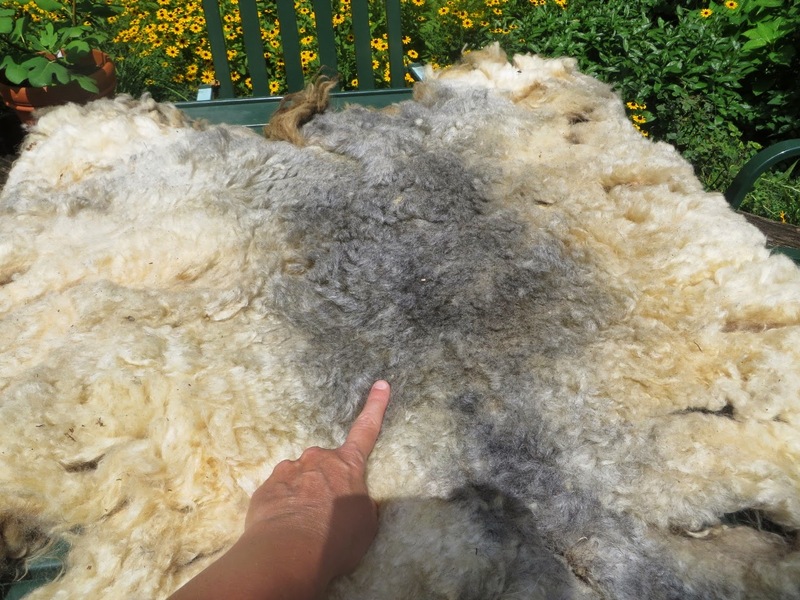 Wool is scoured to remove the lanolin and sheepy sweat, called suint, plus other assorted potential contaminants. Dawn dish soap is a popular and inexpensive scouring agent. Sure, I could purchase special stuff, and perhaps even save some money that way, but Dawn is available at the grocery and we use it daily, so it's sensible for us. 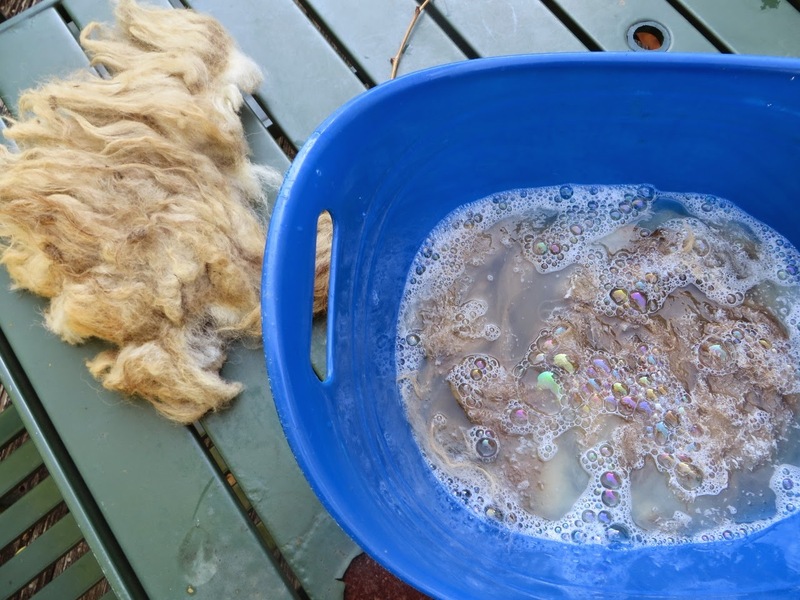 Water is heated to too-hot-to touch, in goes a big blorp of soap, and then the locks are laid in gently so as not to agitate them and accidentally start the wool fibers felting together. They sit and marinate for about 15 minutes. Then the now yellowy-brown water is emptied out, and then there's another hot bath, and then another if needed. In go the locks! Noah is home with a fever and heavy congestion. He cools off in the morning air. A final bath for a few minutes in hot water with a blorp of distilled vinegar to neutralize the alkaline action of the soap, and then the locks are set to dry for a few days, either in front of a dehumidifier or in the sun, or both. 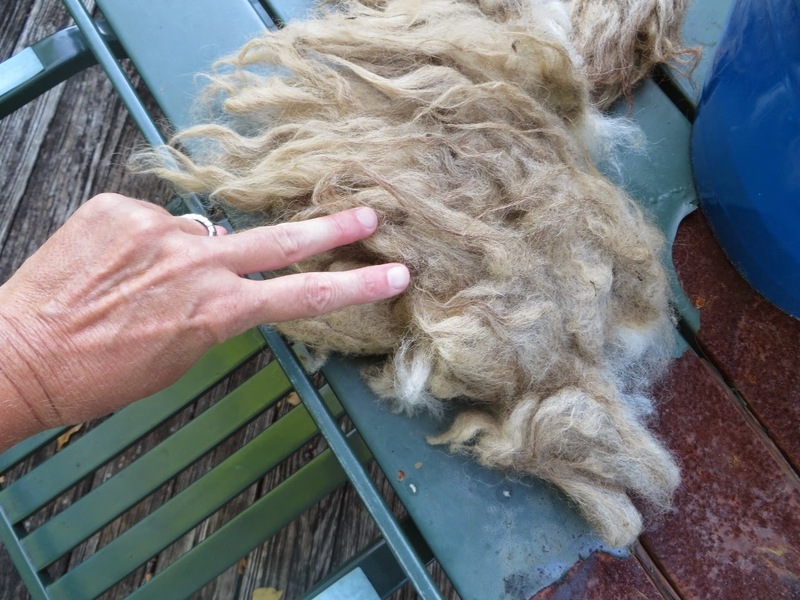 Once the locks are dry, then it's time to get the rest of the hay and bits of dust out, preparatory to combing the wool to prepare it for spinning worsted-style. Worsted yarn requires a particular combing of the yarn and a style of spinning that makes it lustrous, dense, and smooth. But back to teasing. Here is a lock of washed but very dirty Shetland. Now, many spinners would throw this lock away as too much a of a pain to bother with. Not me. This fleece is valuable, and what I have most of is time, not money. It's worth it to me to rescue such locks, to comb and pick out all of the VM. 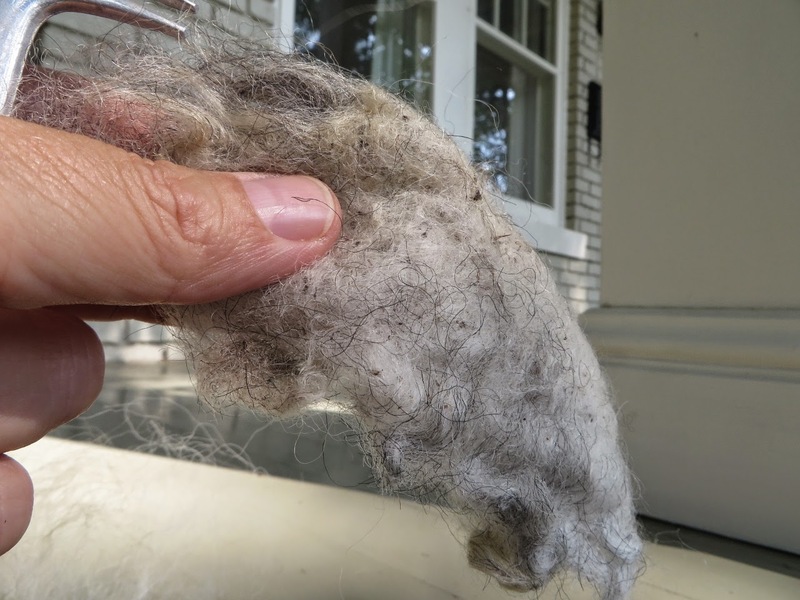 If you look closely, you see the long guard hairs, a creamy color, at the top, then the short full undercoat, with the gray in it, at the bottom. When I comb, I hold it from the bottom, quite tightly, and comb it with a blunt comb. Then if needed, I flick -- lightly hit and pull -- the lock with a flicker comb, which in my case is a sensitive-skin cat comb. Here is a much cleaner lock, creamy white, with the barest deeper cream at the tops. So lush! It won't need much teasing, but just enough to remove any bits that are left. The higher on the back of the fleece you go, the cleaner the fleece and its locks are. Here is a little video showing how I prepare locks. It shows combing, not flicking. This is what a lock looks like when its done. Like a slice of heaven, no? Soooo soft, so gentle, so lustrous. 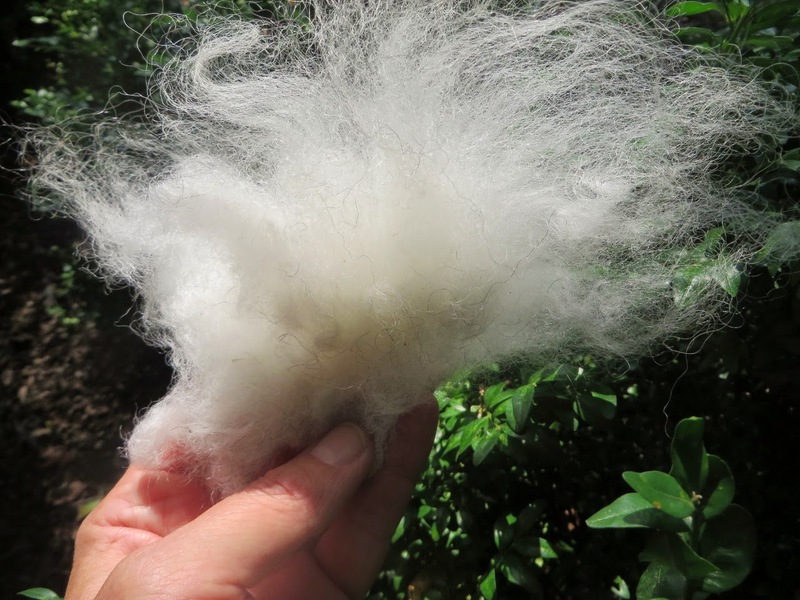 In a blog post or two, we'll look at the final combing -- managed much the same way since the Middle Ages -- that turns the locks into "top", the soft and aligned length of fibers ready for the spinning wheel or spindle. Thanks for describing the process, and with pictures! I love the word "blorp" it's very descriptive. :) The fleece sure is lovely when it's clean. The sheep is so cute and inquisitive looking. Scrummy! I can almost smell it and feel it. 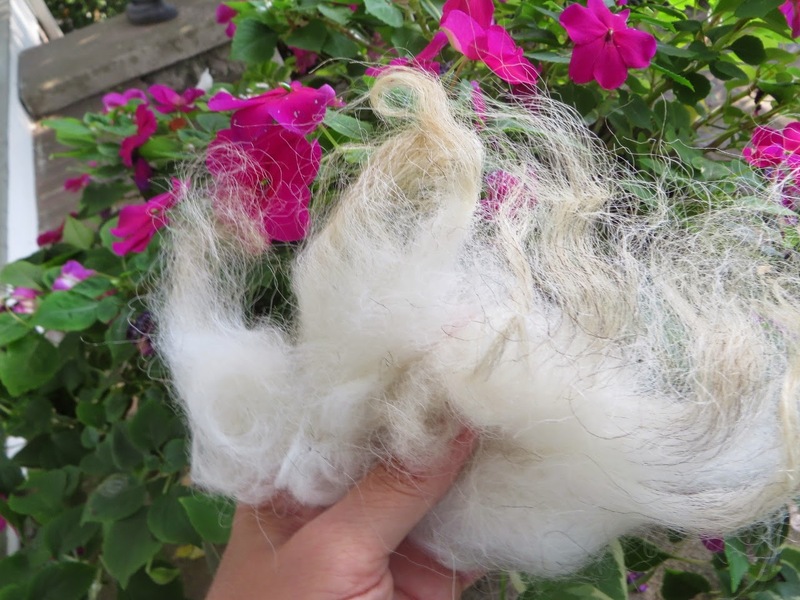 We sell a lot of Corriedale sliver (or roving) which is ready to spin, although most people use it for felting. I love it. Corriedale, mmmmmm, soft, mmmm, good stuff. If you can believe it, Shetland is even softer. See if you can get your paws on some. I understand the undercoat knits up shawls so fine they can slip through a wedding ring. Yes, "blorp" is a great word, and I wish I'd invented it, but alas, Quinn, other fiberists went before me. wow, you have such nimble fingers! The fleece in the end somehow reminded me of mermaid's hair, as it flows up and everywhere around her in the water. I may have said so before, but Noah is such a cutie! I hope he is healthy and hale now and so are you. Thanks so much for the tip with the crinkled paper! I might do it, because with the rags the bustle pad really is kind of heavy. As for those jeans, thanks so much for your compliment! I think I will take the embroidered part and turn it into a pencil case, or sewing case. It's good to hear from you again! Couldn't help but wonder if you were ill again, and am sad to hear that it was true. Here is crossing fingers that you are over the worst of it.